As I said, my wife outsourced dessert to one of our guests, my cousin Amy. What a great call, it’s not often that one of the top pasty chefs on the North Shore decides to whip up a gem like this. Let me tell you, if someone asks me to bring dessert, I stop at Dominick’s and grab some Chunky Chips Ahoy!, some Duncan Hines vanilla frosting, and cross my fingers that the hosts have a clean butter knife in the house. 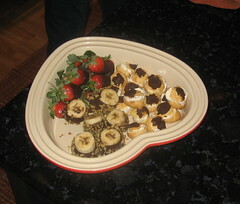 The last thing I expected, in the dead of winter nonetheless, was homemade chocolate covered strawberries, homemade chocolate-topped mini cream puffs, and homemade chocolate peanut covered bananas. To top it off, it was all served in a heart-shaped dish just to show some love. We partook in this third sitting in the family room again, where it all started. It was a great finish to a splendid meal. Let’s review. This Formula 1 meal took slightly over three hours, had two chefs, three separate seatings in two rooms, and nobody fought. How great is that? Posted in food on 2007/02/28 by John.